The experiences of death and bereavement are often intimately connected to spirituality and religion. As counsellors, how do we work with these deeply personal beliefs of our young clients, when they may be so foreign to our own? How do we meet them where they are, even when the link to bereavement isn't always clear? The desire to present a service as welcoming is often equated with being seen to be ‘multicultural’, and results in either the display of no religious imagery or the inclusion of images and symbols from a variety of religions, along with ‘understanding a bit about those beliefs’. But I’ve never heard the word ‘spirituality’ mentioned, even though it is an important aspect of life for many people. Spirituality, to me, is not always tangible but rather a deep experience of connecting with something – a divine being or an energy, or a power that is greater than all of us. For some, it is found in religion, for others it may be in a unique and special experience. I will show here some of the variations on spirituality that I have come across during my 12 years’ bereavement counselling with children and young people in multicultural inner-city areas, using composites of the many children I have worked with, in order to bring the work to life. As with toys in the therapy room, religious symbols and images may be the catalyst that encourages children and young people to question their faith or discuss God-related issues, even when they have no family religion. Recently, I was based in a church in an area where many of the children and young people were Muslim. To arrive at the therapy room, the child and I had to walk through the nave, passing pews, pulpit and a cross. It wasn’t a Catholic church, so there was no Jesus ﬁgure nailed to the cross, but it was indeed large enough to have held an adult ﬁgure. Behind it, a magniﬁcent stained glass window often created a many-coloured glow around the cross. The ﬁrst day I walked with Aahil to the therapy room, he slowed his pace, stared at the dark benches, the prominent pulpit and the wooden cross, and spoke in hushed words. Initially, his comments were factual questions. This is a church? That is where people go on a Sunday? This is where people pray? I responded directly to his questions, and I also reﬂected his quietness. I acknowledged this space was very different from his mosque and gave openings for him to comment or ask questions. We hadn’t reached the therapy room, but counselling had begun. His parents had visited the therapy room, walking this route, and so were aware of what their son would be seeing. I’d openly wondered if they would be uncomfortable with Aahil seeing these Christian symbols. They were of a liberal attitude that all places of worship were valuable – ‘but Aahil is a Muslim!’ I reassured them that although the counselling service was in a church, the counselling was not Christian based. I answered their questions, and I asked one of my own. I was aware that some Muslim families allow images of family members, paintings or photos, and some do not. How was it in their family? Would it be acceptable for Aahil to see photos in the therapy room and – if he wanted – to create images (paint, drawing, clay) of how he imagined his twin brother, Aaban, might have looked. Aaban had been stillborn. The family had photos in their home, but none of Aaban. They did not mind Aahil creating images of Aaban ‘if it would help Aahil through his sadness’. Aahil's focus was on the Christian symbols outside the therapy room, and these were the doorway into his exploration of his own faith, and his coming to an understanding of the death of his twin brother. As Aahil and I walked to and from the therapy room each week, his questions became more probing about 'these people’s’ beliefs about heaven and hell, and death rituals, and God, and good and evil. In talking about these ‘others’, Aahil began to open up about his own thoughts and feelings about his faith, his confusion about Aaban ‘needing to die’, ‘why him not me?’ and Aaban’s funeral, which no one spoke about. In the therapy room, there were photos of funerals and related ‘death images’, including a Muslim temple and one of children gathered around a grave. Aahil never took note of these or other pictures. His focus was on the Christian symbols outside the therapy room, and these were the doorway into his exploration of his own faith, and his coming to an understanding of the death of his twin brother. Not all of my clients were Muslim. There were those with no religion (but often a lot of faith) and there were Christians of different types, as well as Sikhs, Roma and others. Sometimes we have to be creative to make something relevant. At The Candle Project in south London, I have seen what they call ‘the Crem’. From my view of it, the crematorium could just as well be used for a church chapel. It’s made from a Sylvanian Family school. The windows are covered with imitation stained glass. Pews are doll house benches and chairs. The doll house cofﬁn was found in a shop, at Halloween, full of goo. Having a spider web illustration on the lid and being transparent, it needed painting, and then a good wash to clean out the goo. Now it ﬁts nicely into the crematorium. There is also has a rough wooden cofﬁn to ﬁt a Barbie doll. My own therapy room was ﬁtted with soft carpet and contained a wide range of resources, including friendly, scary and angry puppets, wet and dry sandboxes, a range of mini characters and the dollhouse with a cofﬁn to ﬁt the dollhouse characters. Yet there was something one of my clients needed that could not be found within this room. Poppy, a bright articulate nine-year-old, attended a church school, and told me that she went to church every Sunday. But she had been ‘too young’ to attend her mum’s funeral when she was two years old. Now, her Dad had cancer and she was obsessed with his dying and her being ‘left alone’. In the therapy room, she was drawn to the paint and the sandbox. She produced massive, red and black poster-size painted sheets of ‘The Devil’. She feared her dad would not go to heaven because ‘he did not go to church every week’. In the sandbox, Poppy spent the remaining time burying plastic Playmobil characters. She didn’t appear to discriminate who she buried. She would grab handfuls from the basket, pile them in a corner of the box, and bury them one after another. There were no tombstones – she had never visited her mother’s grave. While she dug holes for the grey-haired character, or the handyman dressed in overalls, or the boy on a skate board, or the girl holding a teddy, she would talk about ‘the nice service’ and ‘how lovely the priest’s words were’. When she placed the Playmobil character into a hole, and gathered sand, which she watched intently as it trickled through her ﬁngers, she would ask me questions about what would happen at a funeral. I knew from discussions with her father, that he would not discuss this with her. He was ﬁne with me doing so, but he didn’t see why she needed ‘to talk about all this death stuff’. I learned from Poppy that she had never been to a funeral and her limited knowledge was from TV soaps. I learned that she was ‘rather scared’ about attending her father’s funeral ‘some day’. I reﬂected on what Poppy needed. I could play out a funeral for her, as I had with other children (I knew the basics of a Catholic funeral). My tentative suggestions were met with a clear negative response. Following more thought, discussions with my supervisor, and a difﬁcult discussion with her father, I suggested the following (with her father’s permission): would Poppy be interested in meeting a friendly nun in the neighbouring parish church who would tell her about what happens at a funeral and try to answer any questions Poppy might have? She was. So Poppy and I visited the nun in her church. The three of us sat in a pew facing the pulpit and the nun answered the many questions that Poppy had that day. Then the nun walked her through a funeral. Reaching the front of the church, the nun turned, looked at Poppy kindly and said in a hushed tone, ‘You would be sitting in a pew at the front with your auntie.’ (I had ascertained who would accompany Poppy.) Poppy glanced at the pews, then up at the pulpit and cross, and back to the nun, who continued speaking as we walked through the motions. ‘The doors would open. Men dressed in black would carry the cofﬁn on their shoulders to the front of the church and place it here.’ And so the nun went on explaining what the priest might say, the order of the service, and all the details of a Catholic funeral. I stood a few feet back, supporting Poppy with my presence but not interfering. When the nun had ﬁnished, she served us a cup of tea in ﬁne china and answered Poppy’s remaining questions of the day. We said our goodbyes and returned to the counselling service. We had a few minutes to sit quietly together and we talked about how she felt now and how she had felt these last weeks. Then her father arrived to take Poppy home, as arranged. 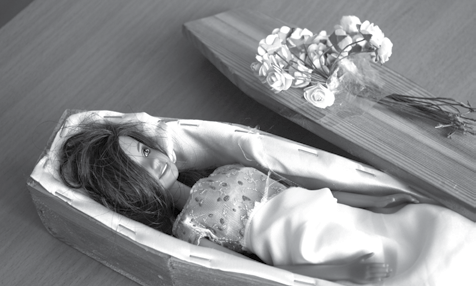 Some weeks later, Poppy gathered in her hands the toy cofﬁn. She brought together ‘the family’ and in silence placed an adult-size Playmobil female into the cofﬁn, and buried this in the sand. We stood together for many moments in silence. As a member of the Religious Society of Friends (Quakers), I am comfortable talking about other religions and faiths. As silence is common in our worship, I do not feel a need to disturb the silence that a child or young person brings into the therapy. My beliefs as a Quaker ﬁt well with my person-centred approach to counselling. We believe that ‘there is God in everyone’ and that we are all equal (in an unequal world). My deeply spiritual experiences happen during silent Quaker worship and among natural settings. In the therapy room, there are bowls of pine cones, rocks, shells and conkers. I am aware that others are affected by other experiences and spaces, and if I could create them within the therapy room, I would. I knew from discussions with his uncle, and from reading, that a Khalsa was a baptised or initiated Sikh who was required to wear the ﬁve ‘kakars’, the symbols of their faith: the kes, uncut hair; kanga, a wooden comb worn in the hair; kara, a metal bangle or bracelet worn on the wrist; kachera, loose, long underwear, about knee-length; and kirpan, the sheathed sword worn on a belt or strap. As I was remembering all this, Gaurav showed me a distance of about eight centimetres. So, he was meaning one that is worn, not a ceremonial kirpan, which may be the length of a standard sword. ‘You know about Sikh religion?’ he asked in a whisper. Perhaps not many white women did. ‘Some of it,’ I said. Gaurav returned the sword to the toy shelf and sat down on the pillow. ‘What do you know?’ he demanded. I sat on the ﬂoor and he threw a pillow at me, which I deftly caught and sat on. ‘I know the ﬁve Ks,’ I said. ‘Name them, he demanded,’ and so I did. This began many discussions. He knew little of his own faith. His mother ‘wasn’t a good Sikh’, his uncle had told me. Gaurav was learning but struggling. His ‘brother’ (cousin) was being brought up as a Sikh and so knew a lot more. This brother teased Gaurav in the playground in front of other children. Gaurav was bullied by classmates about being Sikh. Gaurav felt overwhelmed in the large family. He had been an only child. Furthermore, he was the only Sikh in his year group. Over the months, I met frequently with his uncle and we discussed these and other issues, including his own grief over the death of his sister, Gaurav’s mother. These chats led to Gaurav’s uncle helping his son make his own memory box of his aunt. Gaurav already had one. I came to know a lot more about Sikhism. However, Bo was an often-yawning, seven-year-old Romani boy, who entered my school counselling room soon after morning registration. Since ending the travelling life and moving into a house about a year ago, he had become silent. He would not talk. His school work deteriorated. Many class lessons were spent looking out of the window. He took to play instantly, mostly in the sand, or on the ﬂoor with horses and polished pebbles. Sometimes he gestured for me to play a hide-and-seek game with an object in the sand. The sessions were full of activity, but silent of words. Were these spiritual moments? Gaurav’s talking about his religion and faith with me, and Bo’s restfulness on the pillow and comments about clouds? I do not know. But Bo was always calmer leaving the therapy room, and more attentive for the rest of the day in his classroom. Gaurav now played cooperatively with other boys during break. The teasing stopped, and he and his cousin-brother were friendlier to each other. The opportunities for opening the doors to children’s faith, religion and spirituality are many, both in and outside the therapy room. Religious symbols and images may be keys to those doors, but, as children have shown me, it may not be their own religious symbols. What is a toy to others may be a symbol to them. And sometimes we need to step outside the therapy room. Sometimes, again, the symbols are not available, as with ‘the Crem’, and creativity is needed. But as always, in the end, it is about the relationship between counsellor and child or young person, and our openness and conﬁdence to understand them, learn a bit about their faith and religion, and to seize or create the spiritual moment for stories to be told and shared. Originally published in BACP Children & Young People , September 2012.